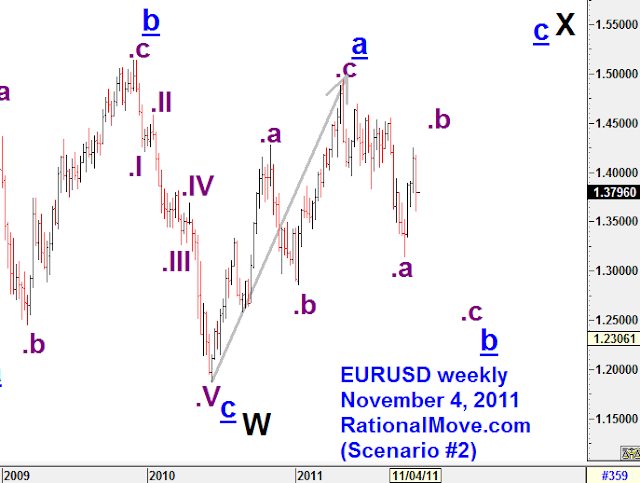 On September 22, I successfully exited after being short EURUSD for two weeks from 1.3960 to 1.3450. 1.3450 was my target and I did not care how much further it’d go down from there. The bottom was 1.3146. Soon after I expressed my view that EURUSD may not get downward pressure for long from there as in the previous post, EURUSD started to rebound strongly. 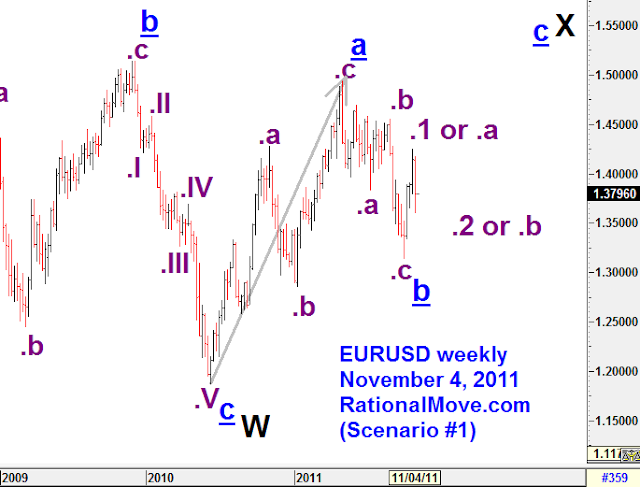 Actually I had been anticipating a EURUSD rally after the pessimism as you can see unrealized X in the chart I posted on September 5th. 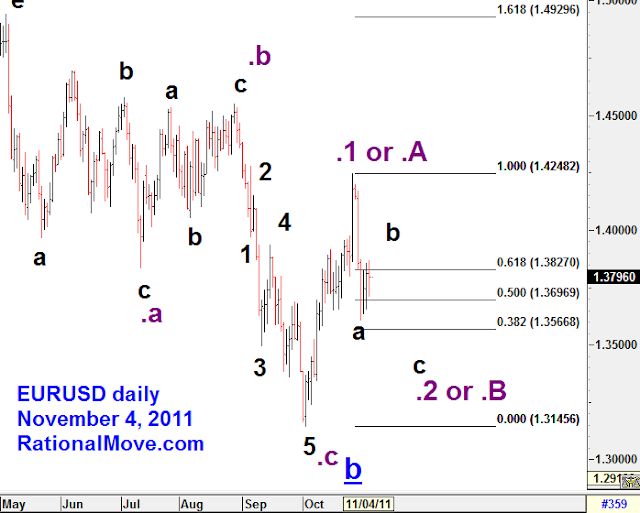 Below is the daily chart if I take Scenario #1. 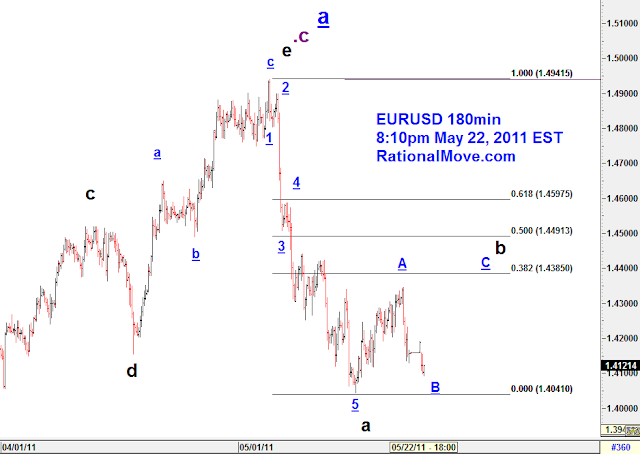 In the very short term, I may be able to take short position from b to c. But I have not made up my mind to participate in this trade. If anything, I’d be conservative since my view is split in two scenarios. 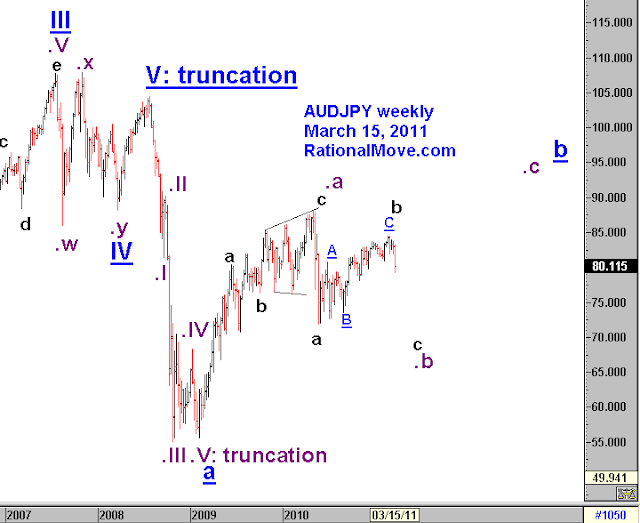 Sell AUDJPY at rally and buy AUDUSD at dip? The earthquake and tsunami that hit Japan shocked the world, and the global equity markets plunged. It was the one more and even more horrifying event to the world that was already busy following the news from the Middle East. Surely it made the price of everything from stocks, bonds, gold to oil volatile. Surely at first, I suspected the massive decline of Japanese stock market becoming the catalyst of the greatest risk aversion after 2 years of what Elliot Wave follower believe to be the massive bear market rally…or should I call it dollar’s sell off against everything else. 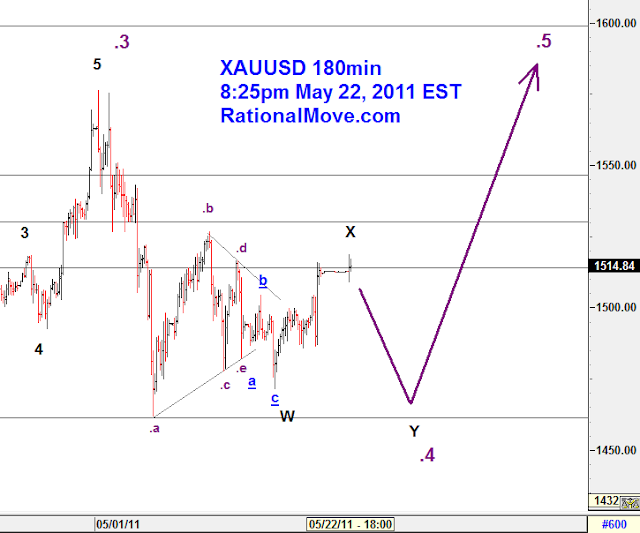 As I zoom up to 360min chart, I see very complex wave structures that I barely managed to label Elliott wave that makes most sense so far. What this wave is telling me is that we are in the woods of very complex IV wave that may dip to 0.9533; this is an support that we call IV wave floor as I showed with gray line. 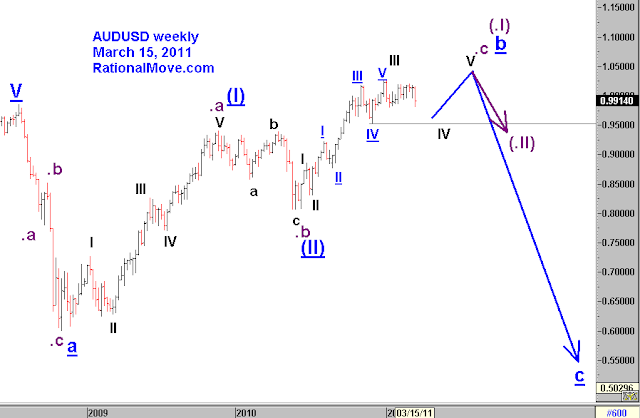 So, as much as I want to short AUDJPY, I would like also to buy AUDUSD if the IV wave floor holds well. 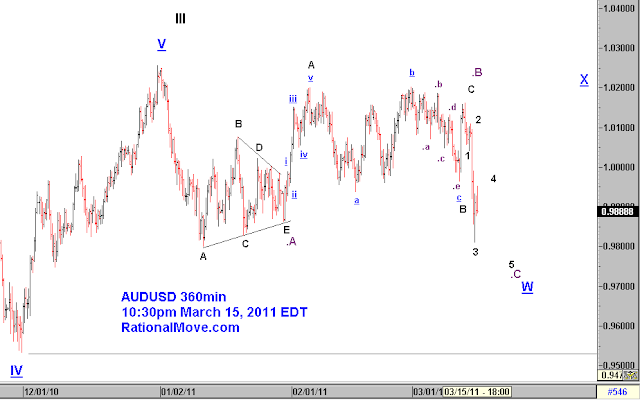 A possible strategy may be to first short AUDJPY at the rebounding rally, then buy AUDUSD at the dip?